Whether it's sour grapes, classic investigative reporting, or something in between, ABC's Primetime Live is about to step up to the mike and start belting out some juicy stuff about American Idol. A former contestant is alledging that Idol judge Paula Abdul provided him with off-camera tips and assistance while he was a contestant- even helping him select some of the songs he would sing! How will it effect TV's top show? Will Paula be forced to up her meds to cope? Stay tuned! 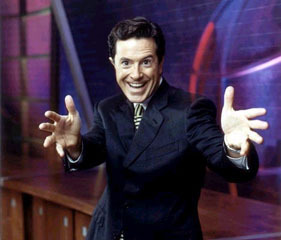 Stephen Colbert, the funniest correspondent on Comedy Central's The Daily Show with Jon Stewart, will star in his own pseudo news show on the channel. Called The Colbert Report, the show will air following Stewart and lampoon cable TV opinion shows such as The O'Reilly Factor, Hannity & Colmes and Anderson Cooper 360. The gig will likely start in September. Our question: With a severely reduced presence on TDS ... will it be nearly as funny? Fox is happy to be back in the Family. 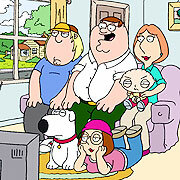 The decision to resurrect the series (first canceled in 2002) clearly paid off, as ratings for Sunday's season premiere of Family Guy drew 11.9 million viewers. American Dad, the new companion show from Guy creator Seth MacFarlane, delivered a slightly less impressive 9.3 million viewers in its time slot debut. Overweight and overrated talk show queen Oprah Winfrey set off a frenzy of motherhood rumors Monday when a promo for an upcoming show hinted that she has a love-child with her long-time beau. "Stedman and I have a daughter," Winfrey said, referring to her boyfriend Stedman Graham. "She has issues and I think it's my fault." But it turns out the daughter is a dog- in fact, her black female cocker spaniel named Sophie. The issue? The show is keeping it under wraps, but I bet it's that the dog eats from the table. So this year's TV Turn-Off Week has come and gone. Are the problems of the world solved? No. But our kids watched less TV than usual, right? Let's find out. So far this season, the average TV household watches 58 hours and 38 minutes of tube (nearly two and a half days!) During Turn Off Week, those same TVs were on 57 hours and 27 minutes, merely an hour less. And that's an uptick of three hours a day, compared to last year's festivities. Did people watch less TV? Sure... a whole 2% less. That's roughly equal to an episode of Desperate Housewives, two episodes of Life on a Stick, or the maximum amount even the most dedicated Rosie O'Donnell fan could watch of Riding the Bus With My Sister. Does that constitute a success? Is it a true victory for the anti-TV gestapo? Who knows? It could mean that this year's TV offered better choices than last year (no The Mullets! ), so fewer sheep switched it off. Or it could be a statistical glitch. Or, most likely, people just didn't participate, out of a conscious decision- or ignorance. I'd like to think TVGS readers ignored TV Turn-Off Week, horrific and misplaced idea, in pure defiance. I agree that there may actually be better ways to spend time than sitting in front of the tube. But there are plenty of worthwhile, high quality, occasionally educational choices to be watched as well. Parents need to step up, and stop blaming the media for society's ills. Except for the Rosie movie. Man... there's no excuse for that one. New episode of Lost tonight. Do we really need to detail any other choices? *Sigh* OK, if we must: last week's postponed Without A Trace hits CBS, Michael Imperioli engages in some horseplay on NBC's Law & Order, and on HBO? It's Starsky & Hutch! What was the flight number of the doomed plane?